As you may know now, Mac OS Mojave 10.14 is available for downloading and installing. In this article, I want to tell you more about this OS version and share my thoughts on why it is worth installing right away. New apps: Voice memos, News, Home and Stocks. Safari doesn’t let ads to track you. You can finally enjoy the Dark mode. Desktop is being cleaned automatically. Finder has Gallery view that makes working with it more convenient. Before we start, I want to remind that upgrade and clean install are different things. In the first situation, you will have your files and settings saved along with some junk files as well. Clean install means that your Mac will work like a new machine which needs to be configured. The last option may be helpful if you notice that software works erratically and this would fix all your problems or in case you are going to sell your Mac to a new owner. Earlier I shared a manual on clean installing MacOS Sierra, and doing the same with Mojave won’t be a great difference. Still, here are the steps for installing it. What do You Need for the Clean Install? Before making any changes to your current system, make sure that your machine is able to work with the newest OS. If you didn’t have any problems with Sierra, then it is likely to be ok, but I recommend to check everything twice. MacOS Mojave installer file, you can find it in App Store. A USB drive of 16Gb or more (for the clean install). If you want just to upgrade, you don’t need a USB drive. Back up your data if you want your Mac to have your previous preferences. Check if you have 1-2 spare hours. As for the system preferences, you need 4+ Gb of RAM and 16 Gb of disk storage. Please clean up your disk drive and save all your data before proceeding. 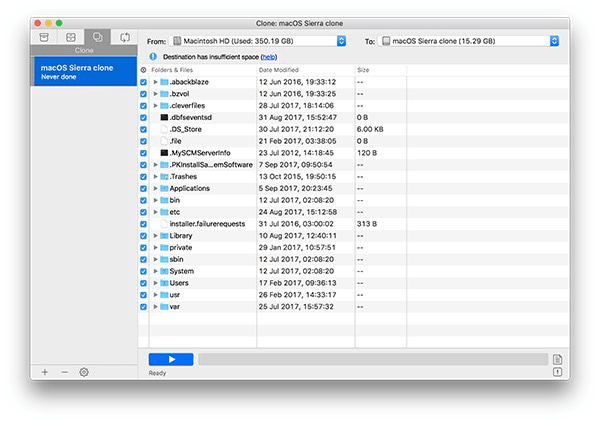 After you have made sure that your Mac supports Mojave, choose the way to clean install your new system. Keep in mind that if you use your startup drive for that, all your data and files will be erased. If you have several disk partitions, you can choose another drive for installing a new MacOS. Finally, let’s see what to do to install a new system. I suggest that we’ve chosen the first option with a startup drive. You need to remove all those junk files and system trash for no space eaters to stay. You can do it manually or use CleanMyMac app that will manage with the task in a few minutes. Run a full scan and get rid of unnecessary files. Use the Uninstaller tab for removing unused apps. As I mentioned above, it is always better to have copies of all important files. You can backup easily with Get Backup Pro app which to my mind is better than built-in Time Machine. Alternatively, you can use an external drive or a cloud service to store your backup. Also, if your apps are customized, I recommend making screenshots of their settings. It will help you easily restore them after reinstalling. Well, having USB drives with bootable installers is always a great idea as MacOS erases the installation file from Mac after finishing the process. Maybe you will need the system’s installer later for helping your family with upgrading or for some other purposes. Creating a High Sierra installer is a nice idea too, as you may want to downgrade someday. Get the newest MacOS version from the App Store. Select ‘Quit’ or tap ‘Cmd+Q’ on your keyboard so the system does not install. The file will be left in the Applications folder. Connect a USB drive of 8+ Gb to your Mac and go to Disk Utilities. Go to the ‘Erase’ tab and ensure that MacOS Extended (Journaled) is selected as the format. Name your USB and select ‘Erase’. After finishing, tap on ‘Done’ and quit the app. Open a Terminal window from the Applications folder or Spotlight. Type in or copy+paste the following command. Replace the [Insert your drive name here] phrase by the name of the USB from the point #5. Type in your password and wait until the process is finished. The Terminal window will show ‘Done’ so you can quit it. That’s it! You are now ready to enjoy your new MacOS Mojave 10.14! Select the Startup disk and choose the installer file. Restart the Mac while holding down Cmd+R to enter the Recovery mode. Connect your bootable USB with Mojave on it to your Mac. MacOS Utilities screen will appear. Click on ‘Reinstall a new copy of MacOS’. Click on the ‘Continue’ button twice in two windows. Agree to the rules and select an internal drive. Wait until the installation process is finished and restart the Mac. After that set up your Mac and get all the necessary apps. You can use Setapp to make the process easier. Erase all the information from this disk. Get MacOS Mojave from the App Store which will be saved in the Applications folder. You won’t need a bootable USB drive for installing it, just choose another drive in the installer. Install the new MacOS: follow the instructions in the app and enjoy your new system after the process is finished!